A Chance to Support Photographer in Publishing Book on Modern Spiritualism – Zero Equals Two! “Spiritualism, the American-born religion, attempts to demonstrate through the intercession of a medium that death is not the end, but a transition. 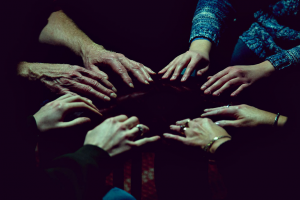 I first became aware of Spiritualism as a teenager, after my cousin received a reading from a medium who revealed a secret about my grandfather’s death that proved to be true. Since then, I have been deeply curious about how a total stranger could have learned something my family had kept confidential. “In 2001, I began photographing at the place where my grandfather’s message was received: Lily Dale, New York, the town which is home to the world’s largest Spiritualist community. I quickly immersed myself in Lily Dale’s world, receiving readings, experiencing healings, joining in séances, attending a psychic college and sitting in a medium’s cabinet, always with my camera. I expected to spend one summer figuring out the tricks of the Spiritualist trade. Instead, Spiritualism’s mysterious processes, earnest practitioners, surprising cultural history and bizarre photographic past became a resource and an inspiration for my own work. I began a sixteen-year quest to document contemporary Spiritualism and to find and photograph ‘ectoplasm’ – the elusive substance that is said to be both spiritual and material. “Photographing Spiritualism presents a unique challenge: how do you photograph the invisible? Sitting in the charged atmospheres of the séance rooms I encountered, I wondered how to approach the exchange between a veiled presence and a visible body? Technical mistakes led me to explore the inherent imperfections within the photographic process. Unpredictable elements (blur, abstraction, motion, flare) seemed to insinuate, or refer to, the unseen. I began to use conventions that are considered wrong, messy, or ‘tricky’. I crossed the boundary of what is commonly considered unprofessional in the practice of photography: I invited anomaly. In playing with the process, the invisible was automated. My camera rendered some striking synchronicities. The resulting images consider the conjuring power of photography itself. I include these pictures that use photography’s own mechanisms to question spiritual realities: photographs that contain both mechanical and spiritual explanations and require an interpretation. “My book on Spiritualism will merge ethnographic study, journalism and art. I will contextualize Spiritualism’s history and highlight its surprising connections to nineteenth-century social reform, scientific inquiry, artistic practice and popular culture. Ultimately, this work seeks to amplify the reflexive relationship between Spiritualism and photography and to explore the ideological, material, geographical, historical and metaphysical correspondences between the two. Erik Davis, author of media studies cult classic TechGnosis and expert on the intersection between technology and the religious imagination, will contribute the foreword. More info and the opportunity to participate here: https://unbound.com/books/seance-spiritualist.